It was sometime around 1997 or so and a group of us were out for dinner. St Supery cabernet was on the wine list for a reasonable sum. "Is it the 94 or 95? ", I asked the server. After a long and justifiable pause/stare, she said that she would check. Doubling down on embarrassing myself, I declined the 95 and instead ordered a beer, leaving the waitress and my dining companions aghast and bemused. I like to tell myself that all of us have histories peppered with regrettable moments like this, but maybe mine more so. Maybe my youth isn't quite behind me yet, either. I was both a victim and champion of the idea that vintage matters supreme. And it does. Sort of. Sometimes. Well, kind of. Though less and less the netter I've gotten to know wine. Grapes, like all agricultural products, are susceptible to the vagaries of weather. The amount and timing of precipitation, hours of sunlight, speed of winds, enduring temperatures and temperature swings all factor into the growing conditions and contribute greatly to what comes off the vine. But that's not the ending, it's just the point when mother nature hands-off the ball to man. Yet vintage charts, which score regions' harvests in terms of quality and longevity in the bottle remain a focal point for many collectors. There is tremendous hazard in this. Not only does it create a false sense of security, but over-valuates vintage as a driving factor in quality. Few people (including those who use vintages charts as signposts) realize that many of them are created based on observations of just a couple of handfuls of bottles that have historically been among the best in a given growing area. To infer any kind of baseline from such an elitist data sample is foolhardy - like saying the new Subarus are great after driving your uncle's Porsche. This reliance also causes many to overlook an entire production year simply because the chart gave the year a lower number than the prior. And that's a shame. Sure, if the weather is absolute crap - hail storms during harvest, for example - there's little remedy to be had in the cellar. But in most years, the weather is neither perfect nor awful in a binary sense. And in every year, crews have to team up and make the most of what nature hands off. If experience and sound practice are employed, even so-so years can yield terrific wines. Case in point is one of my most memorable wines in recent years, the 2013 Domaine de Velanges Macon-Prisse Les Clos. Though more recent vintages (especially 2014) have received greater acclaim in the Maconnaise region, this wine outshines the 2014, 15, and 16 combined. What's more is that the vintage ratings have helped propel the price of this wine from $14 to $20. What I wouldn't do for case of the "difficult" 2013! The point is, unless you're trying to decide between a 2014 and 2015 first growth Bordeaux to save for your daughter's wedding, skip studying the vintage charts and instead get to know producers. It'll taste better in the long run. 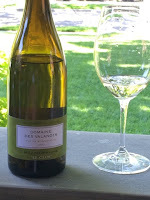 Domaine des valanges is a popular wine in my region where I live. I recommend it the most, I did not think I would find it in any of the entries on this blog. Great, good entry, best regards!